Half-head: this signifies a way of approaching problems that involves efficient thinking, where efficiency comes from an intensely selective focus. A half-headed approach could be a combination of unspoken or unconscious interests, the accumulation of taboos around certain subjects, the desire to appeal to select audiences, the product of an ideology—some or all of these, and perhaps a few more. While a half-head can produce answers quickly, the answers are always half-answers at best. While the imagery produced for this essay implies mockery, and suggests that a half-head is somehow brain damaged or deficient, the objective here is not to laugh at half-heads. In fact, if having a half-head is a problem, then it is a fairly ordinary and widespread problem, where most of us are half-heads, at least half the time. The objective is instead to point out how the half-head dominates US political discourse, possibly more now than previously (say, at Eisenhower’s time). A half-head will only give us half the story. While one might think that two half-heads are as good as one, so that all we have to do is add half-answers together, the solution is a little more complicated than that. First, let’s describe the problem in specific instances. I think that I first became half-aware of the half-head problem when reflecting on years spent studying, discussing and debating the militarization of the social sciences, with reference to anthropology in particular. It became clearer to me that what many of the so-called radical critics of militarization were really objecting to, when it came to US foreign policy, was militarization/militarism, and specifically violence. Anything that involved the military, anything that the military touched, was suspect at best. Most of the US anthropologists who have criticized militarization and militarism have had comparatively less, or even little, to say about US imperialism as a whole (that’s not always true, but it is mostly true). The anti-militarists would generally not touch the non-violent, not overtly coercive, civilian dimensions of US foreign policy, such as the work of USAID, the National Endowment for Democracy, educational exchanges, trade, the work of various force multipliers such as the World Bank and the IMF, and so on. Even “humanitarian intervention” seemed to be generally off limits from their discussions; the same applies to the topic of cultural imperialism (few US anthropologists would even agree that such a phenomenon exists). For them, what figured most prominently was the Pentagon, the CIA, and an array of private military contractors. Having a career-driven research specialization also greatly enables the onset of half-headedness. It is not just a theoretical problem that ensues—that one can provide little in the way of historical context and causality in explaining the rise and significance of militarization, how it is sustained and defended, and how the legitimacy issues of militarization differ in different national political systems (where it is expansionist in one, it is defensive in others). There is also a political problem that results: the anthropological critique of militarization/militarism often plays a supportive role in established political contests among the elites. There is a continuing history of competition between the US armed services (with defense contractors) and the US State Department, over budgets and personnel numbers. The critique of militarization thus operates at the highest levels, as part of an institutionalized complaint by US diplomats and development experts that what they used to do is now being done by the military. The critique of militarization/militarism is not, by itself, a critique of imperialism, nor is it a theory of imperialism, nor is it sufficient in describing imperialism. In fact, one could be an anti-militarist and a pro-imperialist at the same time, and there is an abundance of narratives and persons that exemplify this. Bernie Sanders is absolutely a half-head, and that’s on a good day. When compared to the anti-militarists, Sanders does not even represent the other half of the problem, but rather the other half of another half: i.e., the domestic, non-military side. The almost exclusive focus of Sanders’ campaign speeches has been on domestic income and wealth redistribution, campaign finance reform, and ending the hegemony of banking oligopolies. In other words, his emphasis is on finance: wages, debts, and financial institutions. Where the anti-militarists focus on the Pentagon, Sanders and his supporters focus on Wall Street. However, Sanders also focuses primarily on the domestic front. Sanders thus manages to evade a critique of capitalism, militarism, and imperialism. There is a political bargain that results from such half-headedness. First, if one of the major tools of wealth redistribution involves taxing the very rich, and taxing corporations, it means that such entities must continue to exist—more than that, they must thrive—because they are the cash-cows that will sustain the domestic new deal. Second, that means doing little to harm or impede the success of these corporations in extracting wealth from abroad—“cash-cows” may not be the best metaphor here: these are carnivorous hunters, and Sanders is compelled to wish them happy hunting in the hope of getting a piece of meat to throw to the crowd. Third, it means Sanders abides by the US’ imperialist position in the world, and his supporters do as well, as long as there is a “fair” redistribution at home, of the loot plundered from abroad. As much as these people may feign contempt for “America First,” they believe in a certain version of the same basic principle, except they are more prone to sharing something with those who take the risk to enter the country illegally (a small fraction of humanity). Bernie Sanders is not aspiring to be a scholar, but there are important theoretical problems that arise from his own half-headedness. For instance, his criticism of the militarization of US police forces has no context and no origin. How did they become militarized, and when? What is the source of their militarization? Since Sanders is not an anti-militarist, he never proposes drastically cutting the US’ drastic military spending to fund social programs—his primary tool is instead taxation. He could introduce measures to curtail the militarization of the police, but he has no answer to the problem of a broader political-economy and culture of militarism, which can always reintroduce militarization in this or that sphere of the society at other times. The result of how Sanders conceptualizes his program is a number of dead-ends. For example, he proposes spending on infrastructure to create jobs and alleviate poverty—which is reasonable and positive. However, these are short-term measures (half-measures). Eventually, the bridge is built, the road is paved, the bricks are laid. What happens after that? Where do those workers turn? Sanders also calls for raising the national minimum wage to $15 per hour—which at the very least is a humane suggestion, and not by any means exorbitant (at 40 hours per week, working without any holiday for 52 weeks, one would earn a mere $31,200 at that rate). I am not criticizing the amount, but rather what the focus could suggest: that many workers should reconcile themselves to occupying minimum wage jobs, and that the best way to improve their situation is not to aid them in securing better and more rewarding jobs, but to make their current station in life less painful. If that is the intent, or the result, then the minimum wage boost is not all that “progressive” (whatever this means). Similarly, Sanders calls for tuition-free education at public universities and colleges. This is another excellent idea, or at least half of an idea. On the one hand, the untested and unproven assumption here is that by dropping tuition fees, more poor/working class persons will enter higher education–which might be good, if it were true. That assumes they want to go to college—when many instead drop out of high school. Given the heavy preponderance of middle class youths who attend college, Sanders’ proposal can amount to a subsidy for their class, and thus a continuation of the upward redistribution of wealth. On the other hand, Sanders does not raise the question as to why people should get a university degree in the first place. Here he mentions something about US global “competitiveness,” and no doubt implies a continued emphasis on the “knowledge economy”—rather than bolstering stable and long-term industrial and perhaps agricultural employment. Higher education is thus retained as a prestige object, that promises higher status and higher rewards, which in turn implies the continued commodification of knowledge. When we add everything up, it’s not certain that we have even half a socialist here. Many readers already know that anti-imperialists in the West are regularly accused of being half-heads, probably more so than anyone else. The anti-imperialist is accused of valuing sovereignty over human rights, national self-determination over liberal democracy, or even anti-imperialism over socialism. Indeed, anti-imperialism is not the private property of any one ideology, so one can see how the latter accusation could be logical. However, I generally see each of these accusations as deeply flawed, and I have already devoted excessive amounts of ink, actual or digital, in rebutting them. Instead, the half-headedness that is of interest here involves an interpretation of the significance of the US elections, guided by greater concern for the impact of the electoral outcome on the broader world system, than for the welfare of the average US citizen. For those who are not US citizens (that is most of us), it would not be difficult to reconcile matters this way: “Your own internal fights and outrages about sexism, misogyny, racism, etc., are your own affair; they do not concern us, have no impact on us, and we just don’t care”. The theoretical problem here is that such an attitude could make us forget the interplay between domestic and foreign dimensions of any imperial formation, that the strife, divisions, and conquests practiced at home are frequently visited upon others abroad later. At the very least, forging unity at home is often an impetus for war against a foreign “enemy”. Politically, the problem could be that of forsaking “solidarity” and condemning everyone in the US, which is also an attractive option if we are to be honest. Let me explain that last point. Speaking for myself, it is difficult to either forget, or forgive, the massive shroud of liberal and left-wing silence that arose in the US at the time of the war on Libya. To then turn around and be asked—or commanded—to support such types when it comes time to improving their domestic situation, and enhancing their individual lot, and to rally around their conveniently constructed and selectively directed “anti-fascist” crusade, seems like too much to suffer. A large portion of the US “left” was bought off by democracy-promotion and the “Arab Spring,” cheering bombs that would mythically save lives. What little remained of an anti-imperialist left, was led away from anti-neoliberalism as they cheered “Democracy Spring” and the preemptive pre-regime change of “Stop Trump” at home. It now seems clear that every single sector and shade of the US left has made some sort of peace with neoliberalism, with the basic structure of the status quo, from which their hopes hang even if by the thinnest of humanitarian, cosmopolitan and reformist threads. There is no doubt that the non-US, anti-imperialist half-head in this case is one consumed by a sense of disgust and a desire for revenge. While I am personally less concerned about the political side of the last point, as a theoretical approach it barely functions. There are better options for producing analyses that are more comprehensive and integral. In a meek remark that provoked the ire and abuse of some of Bernie Sanders’ more vulgar supporters, I commented that he was no C. Wright Mills, who had a more complete understanding of US capitalism and militarism, because he saw them as combined. Perhaps they were angry at never having read, or even having heard of Mills? If so, then let me try to remedy that deficit. In The Power Elite (1956) and “The Structure of Power in American Society” (1958), Mills’ explanations can look like an elaborated, in-depth version of what former president Dwight Eisenhower described as the military-industrial complex, but with a stronger focus on the role of private corporations and special interest lobbies. These approaches endure today—because the problem they describe and analyze continues—as shown in the work of anthropologists such as Wedel on The Shadow Elite, Guerin on ALEC (2014), Kapferer (2005) on the corporate-oligarchic imperial state, which complement the more recent work of Gilens & Page (2014) on the oligarchic dominance of US politics, and Dube et al. (2011) on the relationship between the stock market, multinational corporations and the US’ CIA-led coups against foreign governments. Combined, even these few items provide a more robust understanding and critique than what is presented as “progressive” or “socialist” in the platforms of US Democrats. 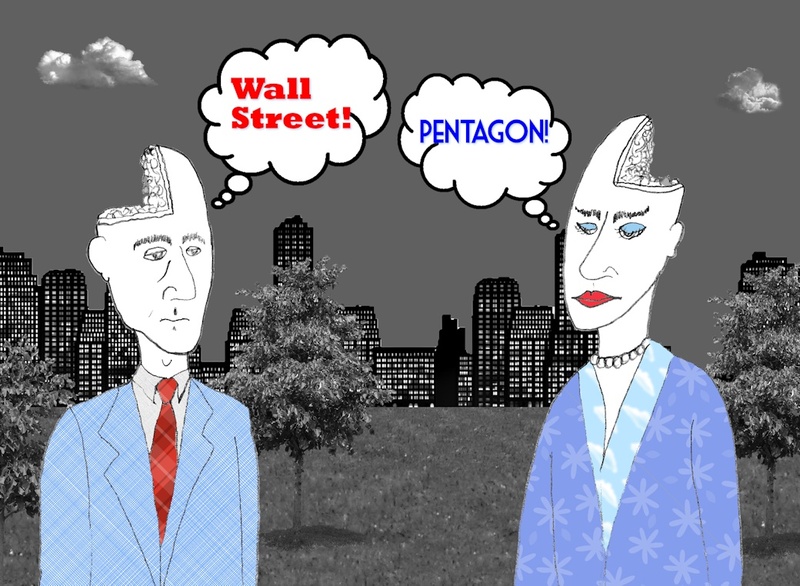 For C. Wright Mills, the problem was not just “Wall St.,” nor the “Pentagon” alone—focusing on one over the other produces a half-headed understanding, with all of the political demerits that result. As he argued in his 1958 article, “the high military, the corporation executives, the political directorate have tended to come together to form the power elite of America” (pp. 32-33). The power elite is what he described as a “triangle of power,” linking corporations, executive government, and the military: “There is a political economy numerously linked with military order and decision. This triangle of power is now a structural fact, and it is the key to any understanding of the higher circles in America today” (Mills, 1958, p. 32). Rather than challenge the arms industry, whose growing size and power stunned Eisenhower, Sanders would simply tax them more. It is open to debate whether Sanders’ is offering even half of a solution, and whether he sees even half of the bigger picture. Usually Sanders has voted in favour of military appropriations, supported the financing of wars in Iraq and Afghanistan, and has backed a range of regime change and “humanitarian interventionist” efforts, from NATO’s war in Kosovo, to support for the Iraq Liberation Act and for regime change in Libya (contrary to his false representations on the latter point). He is also an aggressive supporter of NATO and its anti-Russian posture. While he is not even half of anti-imperialist, some might argue that it is also too generous to see him as half of a socialist–either way, we need to do better than beat each other up with half-answers. Dube, Arindrajit; Kaplan, Ethan; & Naidu, Suresh. (2011). “Coups, Corporations, and Classified Information”. Quarterly Journal of Economics, 126(3), 1375–1409. Eisenhower, Dwight D. (1961). The Farewell Address, January 17. Washington, DC: The White House. Gilens, Martin; & Page, Benjamin I. (2014). “Testing Theories of American Politics: Elites, Interest Groups, and Average Citizens”. Pre-publication version of an article for Perspectives on Politics. Guerin, Mathieu. (2014). “Life, Liberty and the Pursuit of Wage Labour: The American Legislative Exchange Council and the Neoliberal Coup”. In Maximilian C. Forte (Ed. ), Good Intentions: Norms and Practices of Imperial Humanitarianism (pp. 121–145). Montreal: Alert Press. Kapferer, Bruce. (2005). “New Formations of Power, the Oligarchic-Corporate state, and Anthropological Ideological Discourse”. Anthropological Theory, 5(3), 285–299. Mills, C. Wright. (1958). “The Structure of Power in American Society”. The British Journal of Sociology, 9(1), 29–41. Wedel, Janine R. (2009). Shadow Elite: How the World’s New Power Brokers Undermine Democracy, Government, and the Free Market. New York: Basic Books. I would be grateful for Mr Forte’s comment on how the US intelligentsia have, as I understand it, wholeheartedly and wrong-headedly spurned the large volume of Marxist-Leninist, not to speak of Trotskyist analyses of the various manifestations/infestations of capitalism over the last century. It is not, after all, that the contributions of Marxists are collectively or singly “right”, mainly that they can be perceptive tools of analysis. Is pure fear of losing their job the main driving force in this absence ? The situation in Europe has been different at times in the past , though, as far as I can see, has now gravitated largely to the US position, perhaps especially in the UK. Is the Anglo-Saxon narcissistic devotion to “pragmatism” or maybe positivism a half-answer to why the valuable resource of Marxist thinking has been ignored/derided notably, of course, since the demise of the Comintern? Thanks for your comments David, here and on previous posts. I am not sure that I have a comprehensive or convincing answer to your question. Generally I share the view that the legacy of the Cold War and anti-communist hysteria in the US tended to marginalize if not banish outright a great many Marxists and Marxist scholarship. However, that started to change at least by the 1970s. In terms of public discourse, communism is still highly stigmatized, and academics are normally shunned and ridiculed. Even among so-called progressives, they feel safer reciting the publicly-appointed icons of “dissent” (Glenn Greenwald, Naomi Klein, etc. ), than academics who they would tend to scorn–yet that is where you will find the most insightful applications and modifications of Marxist thinking. For me the biggest problem is that posed by the “public intellectual,” one who curries favour with both masses and elites by sending the right signals at the right time, to gain approval; here I am particularly suspicious of celebrity activists, and celebrity journalist-activists, who more often than not act as gatekeepers that lock out some of the more challenging perspectives and questions, while remaining far too loyal to news cycles and play a big part in propelling mass orchestrated emotional outrage, as dictated by the politics of the moment. So, I am generally not very optimistic.